Loyalty programs are an equation of accrual and redemption. With the redemption side becoming more and more opaque, many members struggle to resolve that equation though – with a negative impact on their loyalty. I am not sure whether the Dalai Lama is a member in any FFP. Even if so, it is though safe to assume that he didn’t make that statement while thinking of FFPs. But actually, he could have done so. Delta was heavily criticised when becoming the first major FFP to stop publishing award levels, but to show concrete award levels during the award booking process only. This makes it obviously easier for the program to implement any price increases without the « need » to inform customers about them. But technically, SkyMiles still applies regional award tables and several bloggers around the world don’t do anything else than checking regularly their site to detect any price changes. Thanks to such sources, you can actually still find Delta award charts on the internet, albeit not on the Delta website and never with any real guarantee for accuracy. Recently, several other programs have chosen the voluntary strategy of eliminating transparency on the redemption side, whereby three different cases might be distinguished. In the first group, programs are switching to a fully dynamic redemption pricing, as witnessed by Hilton’s recent shift. Obviously, award levels are not transparent anymore if the redemption inventory is linked to a daily rate – and even less so, if the redemption value per point is not communicated, but subject to some more or less sophisticated internal algorithm. While Hilton has just completed that change, many other programs – from Accor to Southwest and Norwegian – have applied such dynamic redemption approach for a long time or even since they started their respective programs, making it difficult for members to set clear award goals for themselves. In the second group, you’ve got the « intellectual » programs looking for perfection with their pricing calculation by basing it on a city-pair basis, such as just completed by Flying Blue. Unless you are a fairly small airline with a limited network such as Aegean Airlines, it becomes obviously impossible to publish any award levels and you have to replace them by a calculator. But if the pricing methodology is not transparent (as it is the case with Flying Blue), there is obviously always the suspicion that pricing levels can easily get changed, especially if you call Delta your best friend (although in the concrete case of Flying Blue, they do promise that this won’t happen). And with literally thousands of individual pricings (unlike Delta’s continued region-region logic), it is impossible for anybody to monitor them in practice. However, if the system gets too complicated, the unavoidable lack of transparency will ultimately lead to frustration with members. Take the example of a flight between Munich and Moscow. The Flying Blue calculator indicates that award flights start at 9,000 miles one-way in Economy Class. Only when going to the booking function, full details become really available. There you will realise that even several months ahead of travel, that as-of-price might be available on very few Air France or KLM flights (not necessarily the most convenient connections), while most connections would rather run at a lowest price anywhere between 14,000 and 69,000 miles. And maybe even more shocking, nonstop flights on partner Aeroflot (what would definitely be a more convenient option for such a connection) runs at a fixed price of 14,500 miles one-way or 60% above the displayed lowest price. So, the attempt to create certain transparency with the calculator rather creates frustration since members will struggle to get the price they were hoping for in the vast majority of the cases. And the third group consists of programs, which seem to have something to hide and just refer to the calculator. Take Qatar Airways, which has removed award tables, although it still applies a pretty transparent pricing in the backend, but simply has opted not to publish anything anymore, hoping that not everybody realises like that that it has actually increased most award levels by between 40 and 70%, without hardly any advance notice. Or Etihad, for instance, is right now announcing changes to the redemption levels on 30 June, referring to its calculator for more details. The latter, however, would not provide any information at this point what will happen in a few days’ time and it is everybody’s guess why Etihad is changing the award levels again after a round of changes earlier this year (which actually turned out to be less bad than feared). Will Etihad follow Qatar’s examples in front of its huge losses and cut back on the costs of the FFP or will it be pragmatic and lower its award levels across the board by 50% to be more competitive and stop its infernal downwards spiral? It would actually be nice if its best customers would not need to speculate about such things, but get clear visibility. 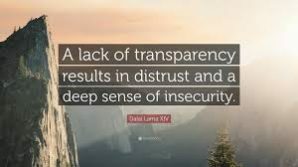 To put this in the right context: A lack of transparency does not necessarily translate into a loss of generosity, although it is clearly the case in certain cases. As example, many (nominative) award levels with Flying Blue got actually cheaper than before, but customers risk even not diving into the question far enough anymore to realise that. On the other hand, you have examples like the Japanese programs showing that you can also succeed differently by making transparency a key element of your customer proposition. Programs do need to involve, which includes sometimes questioning long-standing practices. However, you should also be wise enough to distinguish which practices you may not need to change. But if you understand that a lasting and successful (loyalty) relationship can only be based on trust and the feeling of security, many programs should rather reflect where their current practice of removing transparency will ultimately take them. No need to be at the same spiritual level as the Dalai Lama for that.